As a proud and long-time cross-country mountain bike guy, born out of the glory days of the Canadian Adventure Racing scene in the mid 90s, I stood firm to my belief that mountain biking is about riding your bike, which means going up before you go back down. The downhill had to be earned. The idea of simply jumping on a chair lift, or catching a ride in the back of a truck to the top of a mountain wasn’t something I was interested in – to me, DH was largely a sport for those who ’couldn’t’ climb the mountain first. Now, compare that with what I imagined would be the empty feeling of just stepping off a chair lift at the top, with no effort put in… and I always supposed the experience would leave me, wanting. But admittedly, never actually having experienced true ’DH’, I now realize I was missing some critical perspective. Up until a few months ago, my downhill experience was in my opinion, pretty ’fair’. After all, I’ve raced in some of the biggest XC MTB races Canada and the Canadian Rockies have to offer including, 24 Hours of Adrenaline, National XC Championships in Canmore, the TR3, and the full 7 day Transrockies stage races, which crossed the Continental Divide 3 times and routed us through some of the best downhill tracks places like Kickinghorse, Fernie and Canmore have to offer. All in, I felt I knew what down hilling was about. The single best downhill experience I can recall from those races was day 2 of the TR3, outside Fernie when we climbed almost all morning, and ripped back down a track called Porky Blue. It was a fast, flowing singletrack screamer that left your hands aching, and your heart pounding from countless close calls, as your 26er XC racer bounced and rattled violently, barely remaining in control. It was amazing! The adrenalin, the speed, the intensity – but, like I said it was also well-earned. I had climbed up there to get it. 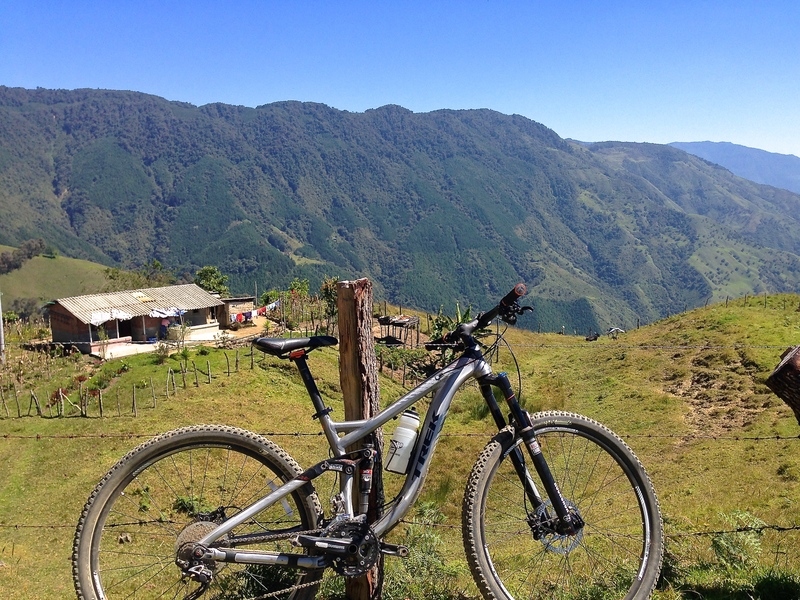 And for me, this was my benchmark for all DH for years, until that is, I actually went downhill mountain biking – in the Columbian Andes. I heard the first rooster crow around 4am, as was the norm, the sun was still well below the horizon of the surrounding mountains. I didn’t necessarily need to get up right then, but I was on vacation and had been ‘out’ the night before – a glass of water and a couple Advil were in order – stat. With my gear packed up for the day, I headed downstairs to the cottage kitchen, made coffee and foraged on day old leftover arripas and eggs. I met my cab at the cottage gates at 5:45am, and explained in my best Spanish that I wanted to go to the Nikai metro station. 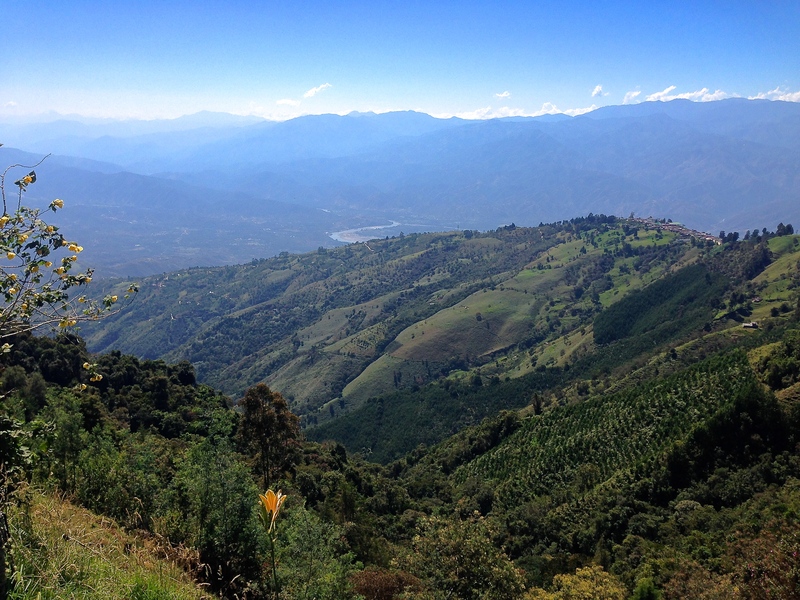 As we drove down the peaceful, narrow cobblestone mountain roads past small mountain-side farms, Medellin was already awake and well into her day and we hit the busy freeway for the drive from the outskirts deeper into town. I’d been given the instructions to wait outside on the steps of the main metro station doors, near the ticket purchase kiosks. It was only 6:30am when I arrived, so I had a little time to kill before the planned 7:00am pick-up time. 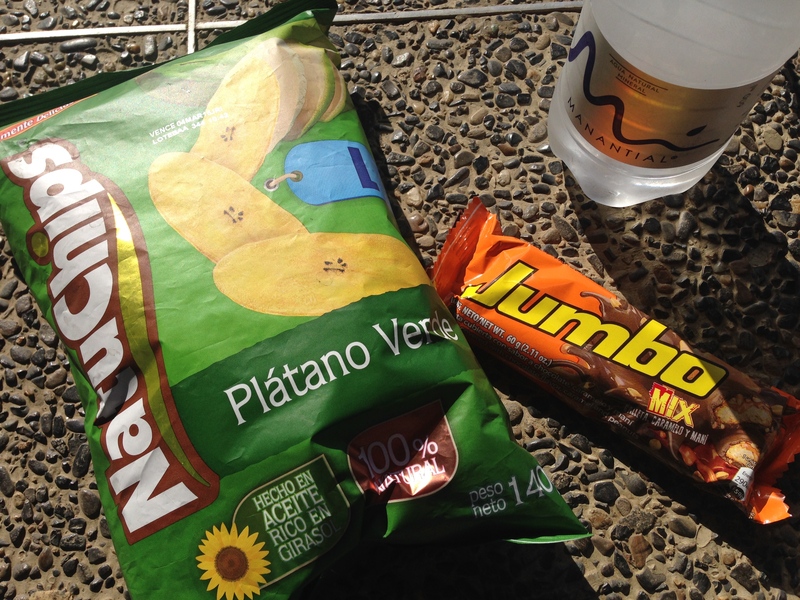 I picked up a coffee and some additional supplies from a nearby convenience store, like plantain chips, a couple candy-bars, water, and some juice – it was another clear beautiful day in Medellin, already hot out. 20 minutes later, not more than a moment after I’d pitched my empty coffee cup, I noticed a white van, loaded down with mountain bikes. I waved back as two enthusiastic arms waved out the open windows toward me as the pulled in and parked. Nicolas and David, our local guides for the day, greeted me with big grins, and boisterous handshakes before they loaded my bags and I hopped in to the back with my new pals Bojan and Gerry, who I’d met earlier on my trip through my brother. Gerry, a uni friend of my brother was an engineer with Blackberry, and Bojan, also an old uni buddy of my brother, was a PhD. computer hardware architect working in Silicon Valley. 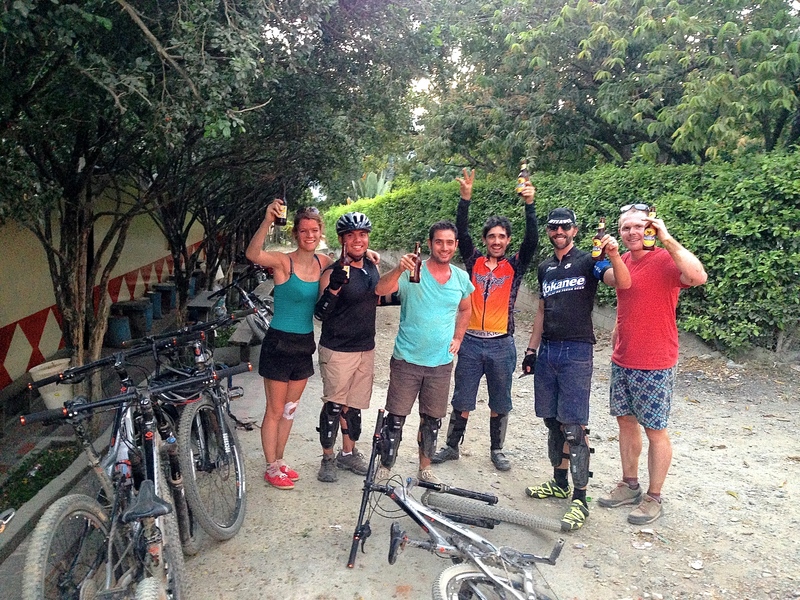 Bojan organized the whole bike trip for us, and had also invited two other travelers along who he’d met the day before at his hostel– an American named Grady, and a criminal psychologist from Holland, named Tamar. As we drove out of town, Nicolas, our guide who spoke very good English, explained what was in store for us. It was a 2 ½ hour drive out of town up into the mountains, to where we’d start the ride. Once there, we’d have well over 2000 meters of vertical decent to look forward to over a planned 35km route of mixed rural gravel roads, and an extensive single-track network made up primarily of ancient horse trails up & down the mountain side – in this part of the world, the primary mode of access to where we were going, was still the horse. Otherwise, this was only the domain of the Toyota Landcruiser or other highly capable off-road mods. Once out of the city, the long drive up the switchback mountain roads, which might have been an opportunity for us to take in the beauty of the ever-changing Andes’ landscape, we traded for the chance to get to know the other folks in the van. Even though none of us really knew one another, something in that group seemed to click right away at least to me – everyone seemed cool, interesting, and excited to be there, so the conversations between us monopolized our attention for most of the trip up. I chatted with Grady quite a bit, and quickly found him to be a fascinating soul, a mid thirties guy from the U.S., traveling the world, lending his skills wherever he went to help pay his way and extend his adventures wherever they took him – talk about a guy with great stories and perspectives on things… Tamar, an established criminal psychologist in Holland was in the midst of finalizing her plans to take a 2 year sabbatical from work and cycle around the world! It’s not often you meet people like this. And it’s not often that I feel like the least interesting person in the room, but I don’t mind admitting it here. We finally stopped on the side of a narrow and bumpy gravel road, high up the mountains, seemingly in middle of nowhere, surrounded by tropical forest. ‘We get out now. From here we ride’. Nicolas said excitedly. Nicolas and David unloaded the bikes, assembled and set them up for each rider. They also handed out all our protective gear, including helmets, gloves, arm and leg guards. I’d never worn the arm/leg guards before, or felt I needed them, so I wondered how necessary they were, but wore them anyway. The van had everything we needed, filtered water, energy snacks, a large cooler with our lunch, as well as all the bike equipment we’d need to handle any mechanical issues we may encounter, and of course a first aid kit. The bikes were impressive. Brand new, 150mm full suspension Trek Remedy 7, 29ers with seriously mean looking knobbies! By far the biggest, most capable downhill rig I’ve ever ridden. At first it felt massive, unwieldy – but I immediately appreciated its potential and the quality and newness of the bike. I couldn’t wait to point it downhill. It was roughly 11am when we finally parted ways from the follow vehicle – and we started off, but instead of pointing our bikes down hill, we were instructed to start pedalling our way further up the mountain. At first I didn’t understand why we just hadn’t been let out further up the road, but as we climbed, the road quickly and clearly turned impassable for most vehicles. It even became a bit of a slog for us on the bikes. 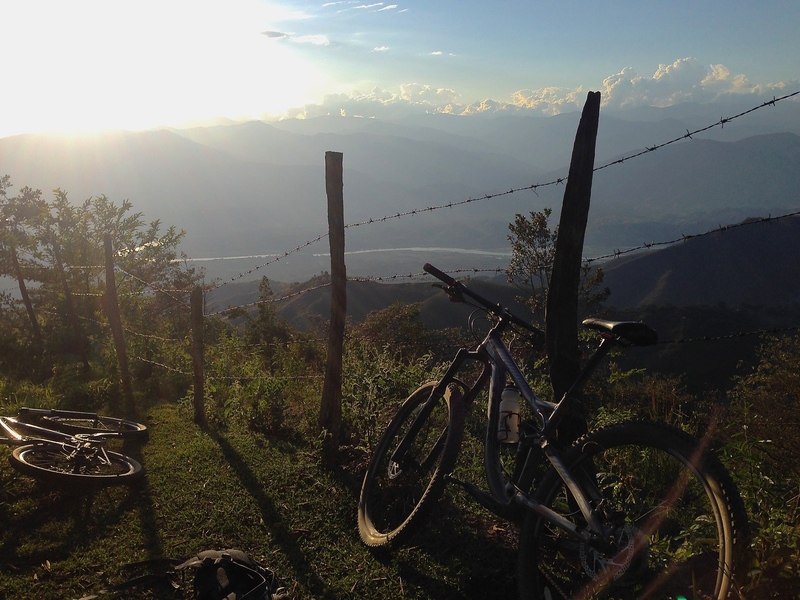 Thankfully though, it wasn’t long before the chatter of the forest died off, and the dark canopy pealed back as we crested the top and the massive valley floor opened up far and wide, below the bright blue Colombian sky. Up here the dirt roads were hard, sun-baked, and a little sketchy with a thin layer of gravel that allowed them to still be very fast, but also giving you the sense that you were always sliding around. Toss in the random bumps and larger rocks, salted along the road, and you had to pay attention, especially around the numerous downward pitching switchbacks. This was hard to do because the views from up here were amazing, and distracting. In fact we hadn’t been going that long, not more than 15 minutes when our group had its first crash. Bojan, an experienced downhiller, had screamed off from the start and taken the lead down the road. I was right behind him and flyin’ too, feeling confident on a rig that was so heavy and stable, but at each corner, he’d go out of sight for a moment till I came around it. On one corner however, I watched him disappear and then saw a massive puff of dust through the trees and heard a loud clatter. As I came around, I saw Bojan hopping up and down like a maniac next to his bike, which he’d laid down hard… Thankfully he was okay – just a case of taking the corner too hot, but it was road rash city for him! His right shoulder, upper arm and thigh took a beating – looked like he’d cozied up to a cheese grater. He put on a brave face, but it was clear it hurt. I wasn’t sure if he was going to continue… But, he did. 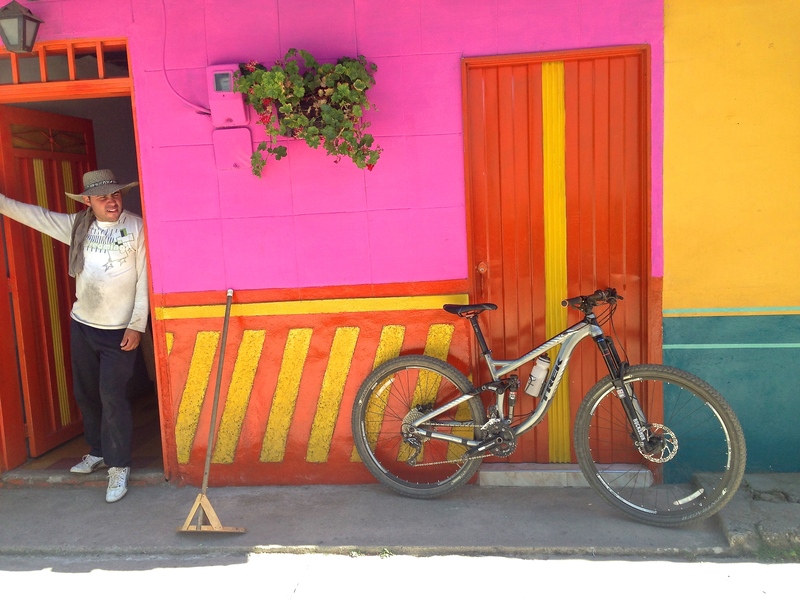 The bike was fine, and after just a few minutes to collect himself, we set off again – though I think we all dialled it back a bit until we rolled into the colourful little town of, Sopetran. 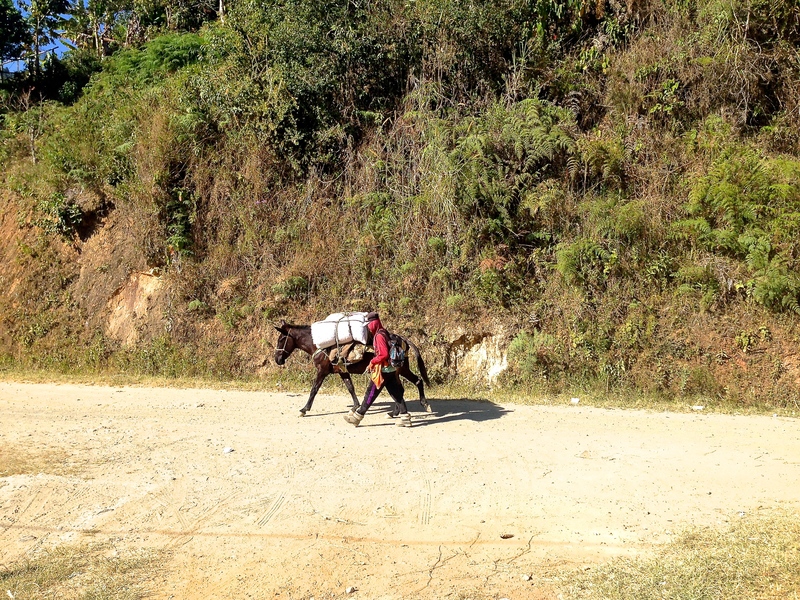 Sopetran was a bustling mountain metropolis of just shy of 100 people, and consisted of only one road. 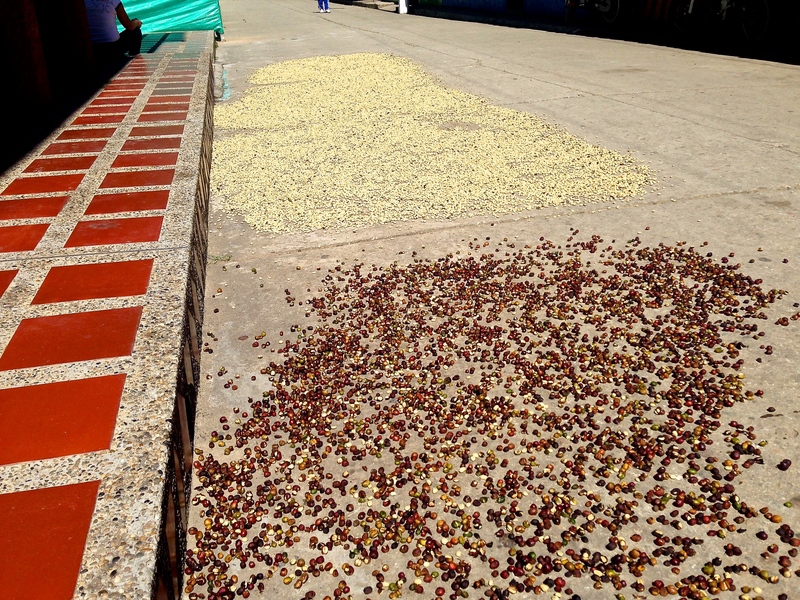 It was a magical little place in the world, with well-kept brightly painted houses, and a patchwork of surrounding micro farms, mostly coffee and plantains. Nicolas explained that often the two grow together because the plantain trees provide the shade the coffee needs to grow. This was a great lunch spot – sitting in the shade of the café veranda, shielded from the blazing sun, looking down from this tiny mountain town, you felt like you were honestly on the top of the world. It was so quaint, and peaceful, with no vehicles at all except for ours. After a big lunch, prepared by David and Nicolas and some fresh brewed Colombian coffee, we slathered on some more sunscreen, geared back up and rolled about 10 minutes further down the mountain to our first trailhead. ‘Singletrack here, is… different than you might be used to. These are ancient horse trails, completely natural with no trail maintenance or grooming. It can be tricky.’ Nicolas said, nodding assuredly. Most of us followed Nicolas down the trail while one of us stuck to the road and we parted ways. At first the trail was essentially what I expected and felt familiar to trails at home, but it started to steepen, and narrow into more of a shallow v-shaped gully, maybe 2 or 3 feet deep, shaped by erosion – and the large rocks kicked loose by the horses made it, just as Nicolas said, ‘tricky’. I quickly fell far behind both Nicolas and Grady. When I caught back up at the next fork in the road where they’d stopped to wait for the group, I said, ‘Yes. It is tricky! That’s hard work, too.’ already feeling like my back, shoulders, arms and hands were taking a beating. He’d clearly left me in his dust on that trail, so I didn’t doubt his advice but other than dropping the seat height, I was dubious about my ability to follow it out. Once we were all back together, we continued and I quickly got better – the lowered seat helped, dropping my center of gravity, and changing my body position so I sat further back behind the bars. And, now feeling more comfortable, I let the bike carry more speed and looked further down the trail, instead of focusing on each big rock immediately in front of me. To my surprise the bike took it all, without so much as a wince – though not to say it wasn’t still hard work. In hindsight, I shouldn’t have been so surprised, but in my experience with XC bikes, trust me, the kinds of rocks I was working so hard at first to dodge would have meant a taco’d wheel and a spectacular crash if I’d hit them on my racer. We got to the bottom of that section and waited for the follow car to catch up. I was starting to get comfortable on the bike and lovin’ it, but I was also already starting the feel some fatigue – as any MTB’er knows, going downhill isn’t as easy as it sounds. I looked at my watch. It was nearing 2:00 in the afternoon and to me, even with the lunch stop, we’d already put in a reasonable amount of down-hilling – all in, maybe a solid hour’s worth… We were in some thick forest at that point so I couldn’t see where we were really, but I imagined we were probably nearing the bottom. I was wrong. We’d only covered 10km. We still had 25kms to go and Nicolas suggested we pick up the pace. We had to take the road for a little while, before we hit the next trailhead, and then after that, we had to do some climbing. ‘How long is the climb?’ Bojan asked. ‘About 30 minutes, by bike.’ answered Nicolas. 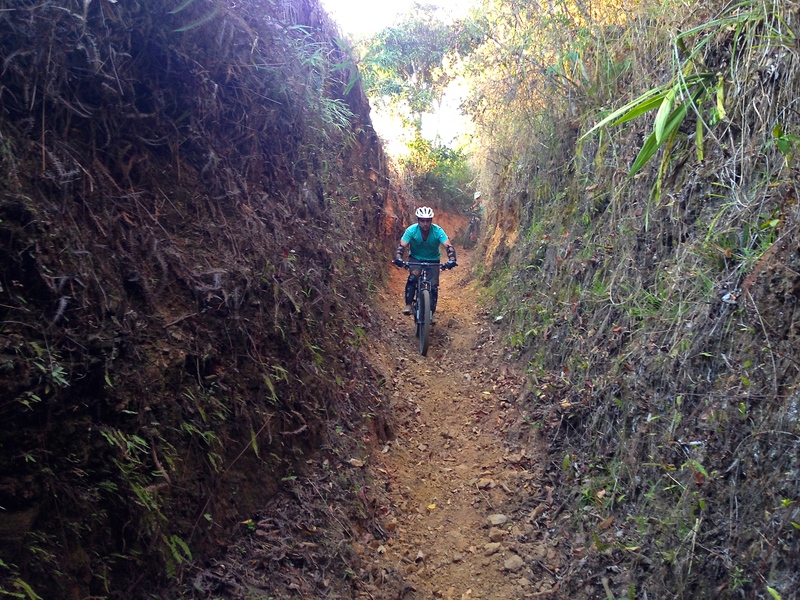 After another blistering fast rip down the road, the next section of single track came up quickly. Again, most of us dropped into it. This is where I had my first crash of the day, and learned the value of the shin and arm guards. Though I hit the deck pretty hard, I jumped back up largely unscathed. Note to self: protection is good. Funny thing was I didn’t realize just how soon I’d need that protection again. Piloting down a narrow section of trail with high dirt/rock walls, I came around the final switchback leaning so far back that I was essentially sitting on the rear tire. I rolled out the bottom fast and back out on to the road, where I skilfully skidded out and tipped the bike over on the bigger rocks lining the sides of the road. Needless to say, everyone was very impressed. But again, thank you shin and arm guards. Once at the top, we rode down a flat section of road that went along the side of the mountain for a while. It was at this point, just riding along in the late afternoon sun, past even tinnier little villages, and farms, smiling a waving kids leading coffee bean sack laden horses and looking out across the vast valley below, where I had time to reflect on where I was, what I was doing – and the amazing people I was sharing this day with. I couldn’t help but feel a sense of ‘awe’ about it all. I felt like it was already a day I was never going to forget. But the best was still yet to come. Back with the follow vehicle, and all together again, we powered up on snacks, chugged some water, and rolled out on the final 16km drop. ‘This is a why I wanted to come across the valley this way. From here, we can go right to the bottom, and link together many amazing trails.’ said Nicolas. And with that, it was game on. Nicolas led, and we did our best to keep up, as he took us down the mountain, from trail to trail, only hitting the road long enough to cross it before dropping back into the next section of single-track. It was glorious as we dipped in and out of the forest cover, giving us the most incredible glimpses of the valley cast in the glow of the setting sun as we descended. And the trails just seemed to get sweeter and sweeter with more flow and speed – it was pure joy, but if I’m honest, it was also shockingly exhausting. My arms were running out of steam, so it was bittersweet when with 6km left, Nicolas got a flat. The glistening, dust-covered smiling faces of the group said it all as we took a welcomed last breather and soaked in the view. But it was a short reprieve. Nicolas had his tire changed in no time and we were on the home stretch. We ended the day off with a few well-earned ice cold Aguilas, and Club Columbia Rojos. So, after decades of mountain biking, that was my first ‘real’ downhill experience. Not too shabby if you ask me. But was it good enough to convert this old XC racer? Well, let’s just say I’ve already started planning where my 2nd downhill experience will take me. 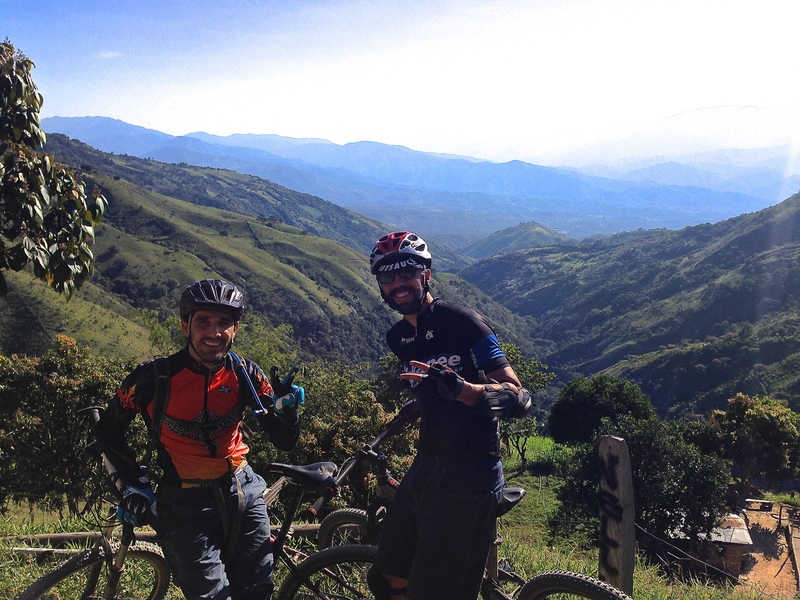 BIG thank you to Nicolas and David, our excellent tour guides, to the San Gil Tour Company and Colombian Bike Junkies, for a fantastic, fun, safe, well-organized and supported day out on the bikes. And thank you too, to Bojan, Gerry, Grady and Tamar. I’d ride with any of you, anywhere.